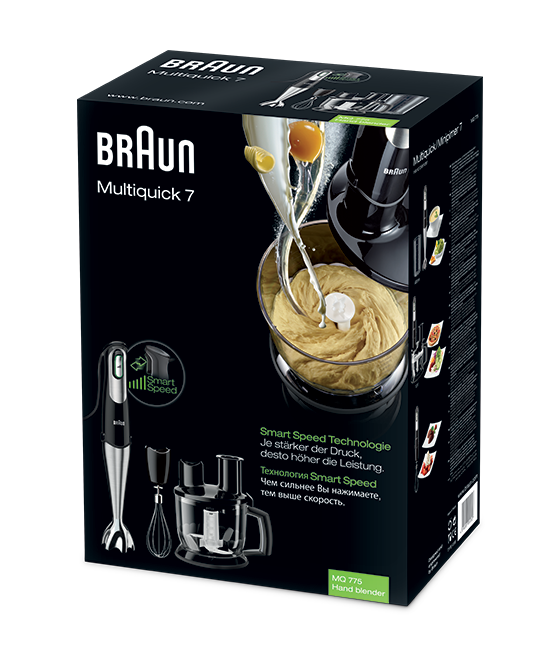 The MultiQuick 7 hand blender MQ 775 Patisserie has a smart speed technology - the more you squeeze, the more power you get. 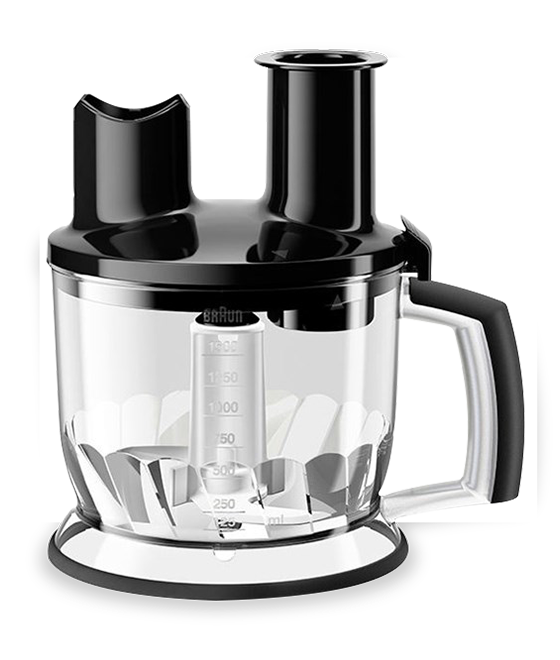 Gently press the speed regulator to accelerate the hand blender, release to slow it down. One squeeze, all speeds. The world‘s first Smart Speed technology - no predefined speed settings, just follow your intuition: Depending on the results you want adjust the power intuitively with the simple squeeze of one button. Push gently for coarse and roughly chopped results and increase the push of the button for more power and finer results - select all the speeds intuitively, without interruption, depending on the results you want. The soft-start ensures constant control no matter how powerful you press the speed button - for a guaranteed clean and tidy preperation. 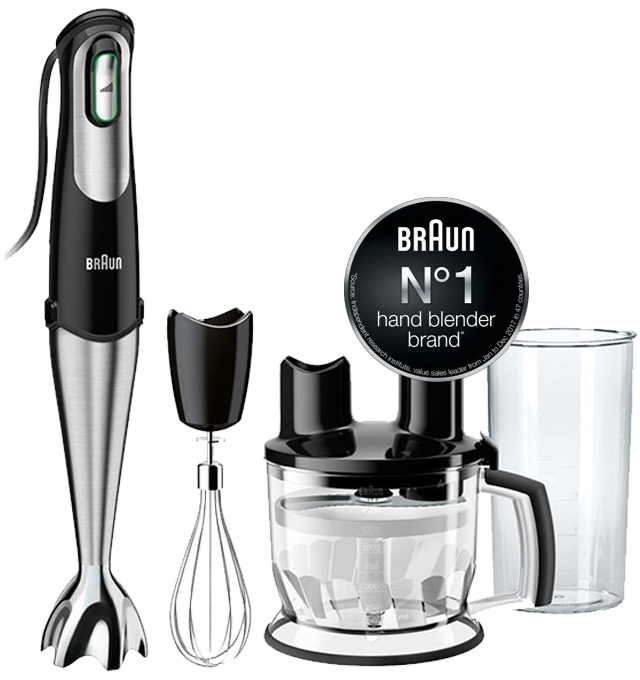 The innovative combination of unique floral bell shape and the position of the blades inside the bell is standard in every Braun hand blender. Change attachments with an easy click. One click, all accessoires: the shaft is easily detachable; a variety of compatible EasyClick accessories can easily be attached with a simple click. Smart, easy, versatile. You’ve never seen faster results for whipping cream, beating eggs, mixing cakes or stirring Hollandaise sauce, as well as making instant and homemade fluffy desserts. Everything goes quickly and easily – from low speed to high. The German Design Council is one of the world’s leading centers of expertise on design. The aim of the German Design Award is to identify, present and honor unique design trends. The red dot is an internationally recognized and sought-after quality seal since 1954. The international jury awards it only to projects that stand out significantly thanks to their excellent design. 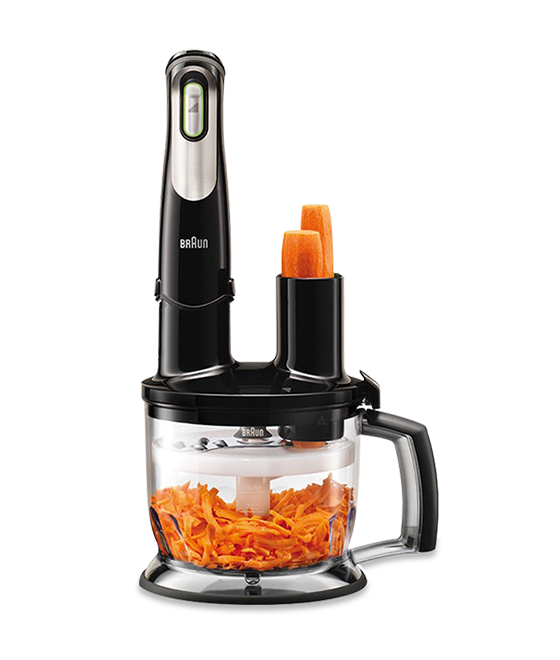 Food processor Chops, slices (thin and thick), shreds (fine, extra-coarse), julienne kneads and cuts into French fries shapes. 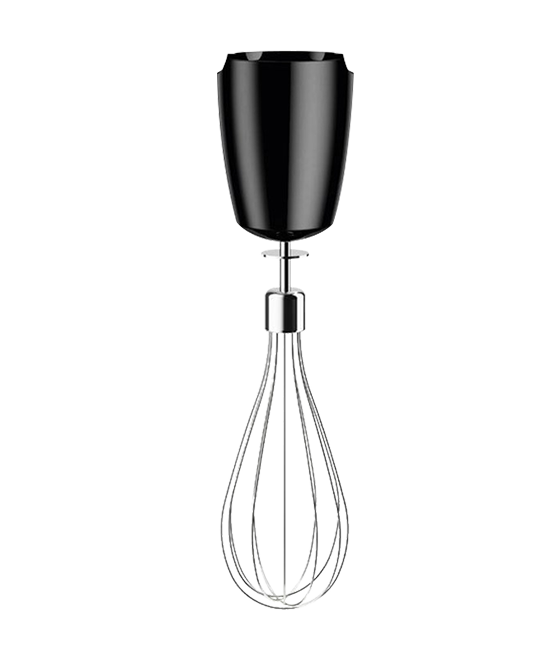 Whisk Easily whips, beats and stirs eggs, cream, fluffy dessert from low to high speed. Kneading The dough hooks are perfectly suited for kneading, making shortbreads and pastries. 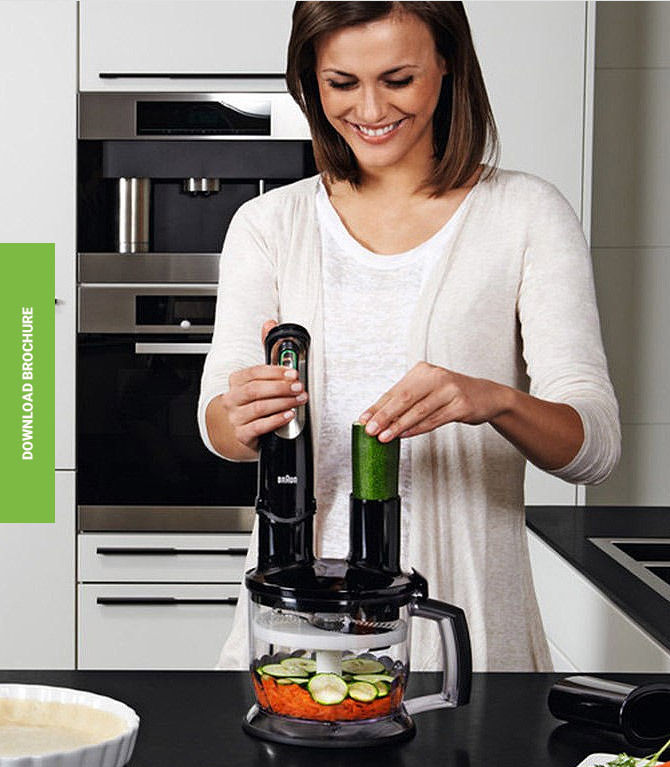 Slicing Wonderfully even slices are provided with the cutter insert in the food processor accessory. Shredding Designed for efficient and precision grating of vegetables and cheese. 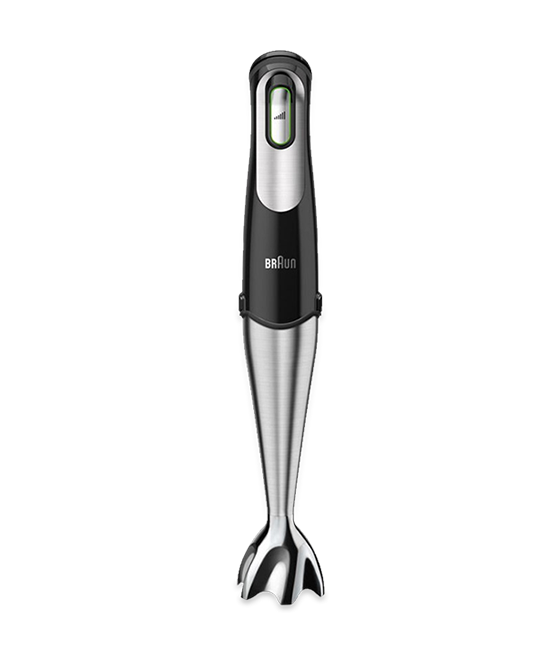 Ultra hard stainless steel blades Ultra hard stainless steel blades, angled in opposite direction to optimise blending results and reduce suction. 600 ml BPA-free plastic beaker The 600 ml plastic beaker is BPA free and features ml and floz measurement markings. World's first Smart Speed No predefined speed settings, just follow your intuition: Depending on the results you want adjust the power intuitively with the simple squeeze of one button. 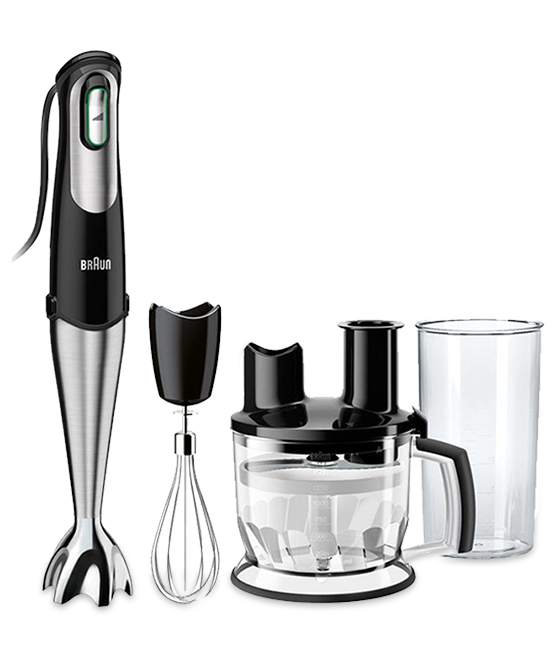 Powerbell Technology World's first hand blender technology. Proven to produce finer and more even blending for perfect results. Unique anti-splash design to ensure a spotless kitchen. 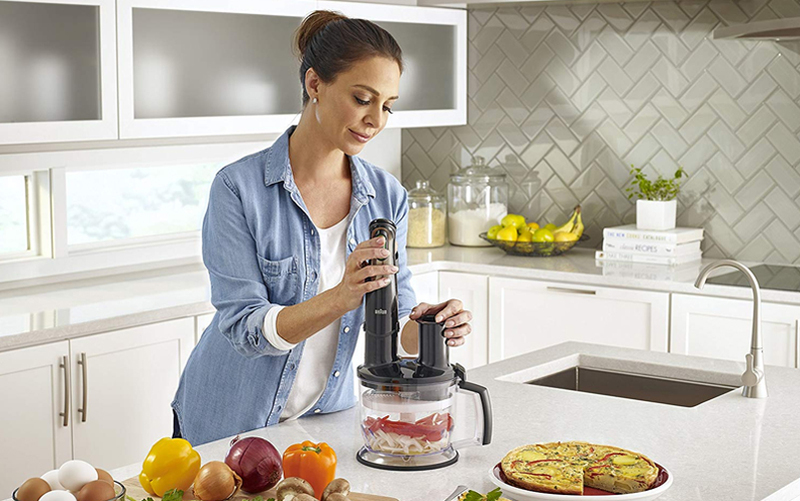 Powerful 750 W motor For fast and easy preparation. 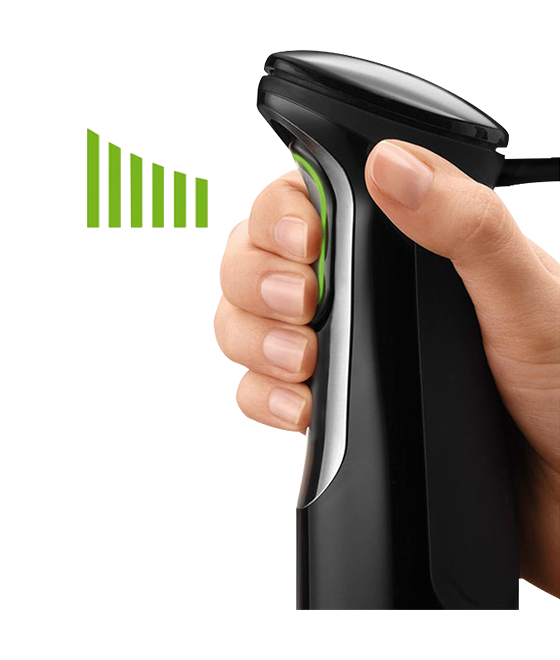 SPLASH Control technology Prevents splashing – to keep you and your kitchen spotless. Safety lock For maximum security, the patented child safety lock prevents any unintended use. EasyClick system Two buttons, one movement for quick and easy changing of all the great EasyClick accessories. Soft grip handle Partly soft grip handle for better handling and improved control over performance. Dishwasher safe accessory Makes cleaning easy.